Outside of Constantinople, towards the district of the Seven Towers, there was in ancient times a very large and most beautiful church named in honour of the Theotokos; it had been built about the middle of the fifth century by the Emperor Leo the Great (also called "Leo of Thrace," he is commemorated on Jan. 20). Before he became Emperor, he had encountered there a blind man, who being tormented with thirst asked him to help him find water. Leo felt compassion for him and went in search of a source of water but found none. As he became downcast, he heard a voice telling him there was water nearby. He looked again, and found none. Then he heard the voice again, this time calling him "Emperor" and telling him that he would find muddy water in the densely wooded place nearby; he was to take some water and anoint the blind man's eyes with it. When he had done this, the blind man received his sight. 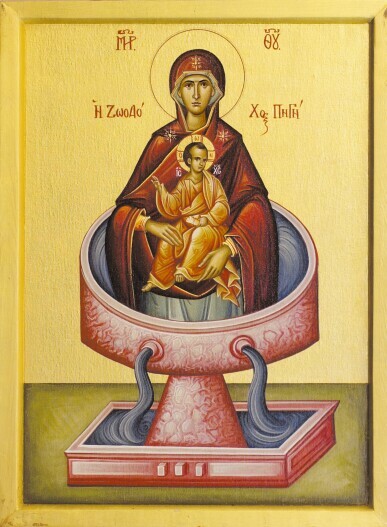 After Leo became Emperor as the most holy Theotokos had prophesied, he raised up a church over the spring, whose waters worked many healings and cured maladies by the grace of the Theotokos; from this, it came to be called the "Life-giving Spring." The Church of Christ celebrates the consecration of this church on this day. After the fall of the imperial city, this church was razed to the ground and the materials from it were used for building the mosque of Sultan Bayezid. Nothing remained of that church's ancient beauty, except for a small and paltry chapel, almost completely buried in the ruins. This chapel had twenty-five steps going down into it, and a transom window on the roof, wherefrom it received a little light. Toward the western side of the chapel was the aforementioned holy Spring, fenced about with a railing, and with fish swimming in it. Such was the condition of the Spring until 1821. Then even that little remnant was destroyed, occasioned by the uprising of the Greek nation against the Ottoman Empire; the sacred Spring was buried with it and disappeared altogether. But in the days of Sultan Mahmud, when those subject to him were rejoicing in their freedom to practice their religion, permission was sought by the Orthodox Christian community to rebuild at least part of the chapel. Thus the work was begun on July 26, 1833. When the excavation had been made, and the foundations of the ancient church were found, there was rebuilt -- by a later writ of permission from the Sultan -- not merely a chapel of the holy Spring, but another new church, constructed upon the foundations of the ancient one. The building of this spacious, beautiful, and most majestic temple began on September 14, 1833, and the work was completed on December 30, 1834. On February 2, 1835, the Ecumenical Patriarch Constantine II, serving the Liturgy together with twelve hierarchs and a great company of clergy, as well as a boundless multitude of Christians, performed the consecration of this sacred church and dedicated it to the glory of the Mother of God. On September 6, 1955, however, it was desecrated and destroyed again by the Moslem Turks; it has been restored again, but not to the former magnificence. O Lady graced by God, you reward me by letting gush forth, beyond reason, the ever-flowing waters of your grace from your perpetual Spring. I entreat you, who bore the Logos, in a manner beyond comprehension, to refresh me in your grace that I may cry out, "Hail redemptive waters." Share the feast of Renewal Friday: Theotokos of the Life-giving Spring with an icon greeting ecard.